I thank Punjab Government for its continuous support and commitment for comprehensive development of my constituency, Rupnagar. 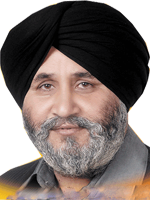 I am very thankful to S. Prakash Singh Badal, Hon'ble Cheif Minister of Punjab for considering dire needs of the area such as Bypass, Sewerage Treatment Plant / Sewerage System, NCC Academy, New Bridge on Sirhind Canal linking the city and state-highway and last but not the least IIT Rupnagar to residents of the city. Through this commitment to my responsibilities and duty towards the people of my area, I would always be at pains to their betterment, prosperity and improving their quality of life with the support of the State Government. © 2019 Municipal Council Rupnagar. All Rights Reserved.